In its first virtual-reality documentary, Frontline transports viewers to a spot under a towering tree in West Africa, believed to be the origination point for the Ebola virus that became a global health crisis last year. 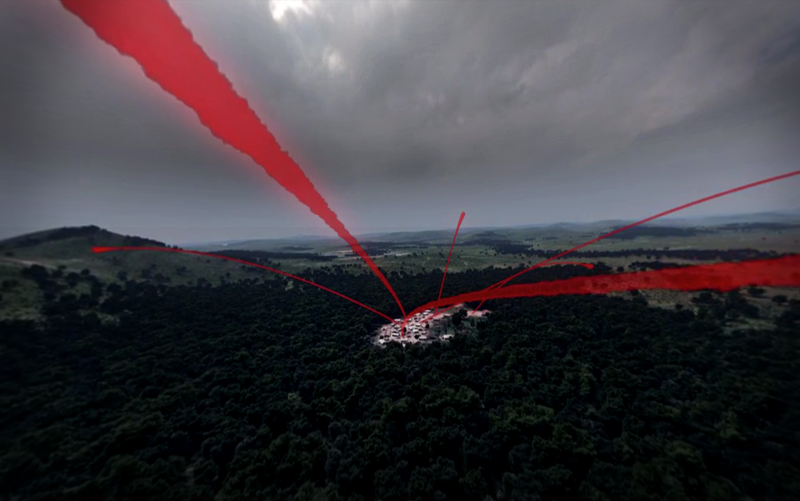 Shot by filmmaker Dan Edge in tandem with “Outbreak,” a broadcast-length Frontline documentary that premiered on PBS in May, the 11-minute immersive film launched on Google Cardboard, a virtual-reality system that requires an Android smartphone and a simple cardboard viewer. The hand-held box holds a smartphone before the viewer’s eyes. An app presents 360-degree environments, explored as viewers move eyes and heads to explore their surroundings. Viewers of “Ebola Outbreak” meet witnesses to the epidemic’s impact and hear their stories. From the hollow tree that had been home to hundreds of bats thought to have carried the virus, “Ebola Outbreak: A Virtual Journey” shifts to a peaceful village scene in Meliandou, Guinea. An eyewitness from Sierra Leone describes the cleansing of the body of a village healer in preparation for her funeral. She had to be buried properly, the woman explains, or her angry spirit would haunt the survivors. Witnesses appear within each scene but aren’t immediately apparent to viewers. Moving the eyes or head brings them into sight, speaking to the viewer. With a grey map of West Africa in the background, red lines representing vectors of the virus cross the screen, landing like bombs of blood in other villages, crossing borders into Liberia, Sierra Leone and beyond. The VR takes viewers to an emergency Ebola field hospital as the outbreak spirals out of control. The effect can be dizzying, which is typical for virtual-reality viewings, especially if the viewer stands while watching. So says James Milward, executive producer and founder of Secret Location, a content studio specializing in digital production and emerging platforms. A VR project that Secret Location created for Fox’s Sleepy Hollow recently won the first-ever Primetime Creative Arts Emmy awarded for Interactive Media. Frontline collaborated with Secret Location and the Tow Center for Digital Journalism at Columbia University to produce “Ebola Outbreak.” The partners unveiled the documentary with demonstrations at last week’s Online News Association conference in Los Angeles. The VR film grew out of Raney Aronson-Rath’s 2014 Open Doc Fellowship with the Massachusetts Institute of Technology. Aronson-Rath, e.p. of Frontline, had to pick a project that would experiment with new forms of storytelling. She chose Edge’s film on the Ebola virus, which was going into field production. Edge had the technical ability to handle the filming, and Secret Location provided the gear, training and remote assistance, said Milward. “We’re always focused on how to tell the story, the platform that is the vehicle for that and what we can do from a content perspective that works,” Milward said. His team had previously collaborated with Frontline on a seven-minute interactive video, “A Perfect Terrorist,” created to help viewers keep track of all the characters in the documentary. She described postproduction of the “Ebola Outreach” as intense. “We were stitching together nine different angles,” she said. Frontline doesn’t have the facilities to handle such a technologically challenging production and relied on Secret Location’s studios and expertise. The simplicity of Google Cardboard makes Frontline’s VR film accessible and affordable, Aronson-Rath said, but she is planning many more demos to bring the “Ebola Outbreak” experience to more viewers. Frontline will be presenting the VR film in academic settings and at public stations. “Ebola Outbreak” will eventually be offered on Oculus Rift, a VR platform slated for release next year, and for Apple iOS, Milward said. The NPR project is among 11 winners of the Journalism 360 Challenge awards.